Lucid Lynx (Ubuntu 10.04) has been launched on schedule and is available for download. There is also a page of complete download options. I heartily recommend using bit torrent. Transmission takes care of the job for you – you just click on the correct torrent (in my case ubuntu-10.04-desktop-i386.iso.torrent) and then click add to get the torrent added to the Transmission queue and downloading. Of course, Shipit is available if you need an official copy. Canonical is trying to cut down on the official copies, so they request that you only use this option if you don’t have the money to buy a copy, or your download speed wouldn’t make a copy feasible. I requested a copy to make sure Shipit was working before I sent anyone to it. Remember that Lucid Lynx is an LTS release – long term support. Once you have it burned to disk or have updated to it, you may wish to go to System > Administration > Software Sources > Upgrades and make sure that the Show New Distribution Releases section reads Normal Releases and not just Long Term Support. I guess I should mention that because Lucid has been released, you can now upgrade to it via update-manager instead of update-manager -d, if you are currently running Ubuntu 9.10 or 8.04 (the last LTS)Technorati Tags: Linux, Ubuntu, Lucid Lynx, upgrade. I don’t know how slow that option will be today. I have had bad luck trying to run the update manager to upgrade to the next version on a release date. May your upgrade go well and your Ubuntu experiences be enjoyable! There is so much news for Lucid Lynx this week that I hardly know where to start. The new quick start sections make it easy to find out how much you can do with Ailurus, and how powerful it is. The Lucid Lynx (Ubuntu 10.04) release candidate is now available. As always, to upgrade from Karmic (9.10) on a desktop system, press Alt + F2 and type in “update-manager -d” (without the quotes). Then, you just need to click on Upgrade and follow the instructions. If you are upgrading from the last LTS (Ubuntu 8.04) on a desktop system, you just need to follow the same instructions. I have found the release candidate to be without any bugs so far. I know that the development team is still working to fix major bugs, but I would be surprised if that many more surface. If you are planning to upgrade to Lucid Lynx, I would recommend upgrading now unless you have a production system. The final release date is April 29. That day and the next one after it will overwork Ubuntu servers. The last time I made the mistake of upgrading on Release Day, I was not able to get my system upgraded for two days. It was very frustrating. Other recommendations for upgrading to Lucid Lynx include changing your mirror from the default for your country. To do this go to System > Software Sources, and click on the current server. The benefit of using a different server is that you should have better download times. This is because not as many people will be pounding on that individual server as on the default server. I have been reading articles, such as this one (http://www.informationweek.com/news/global-cio/showArticle.jhtml?articleID=199600443) which indicate that Microsoft, headed by Steven Ballmer, is using its near monopoly status to extort money from companies that use Linux. Microsoft waves about claims of 235 unnamed and probably unreal patent claims, and companies either stop having anything to do with Linux (like Songbird) or pay out extortion money (like TomTom). Microsoft is so huge that noone dares talk back. Who can afford to go up against a company that has one pretend competitor? Apple, who never is at any risk of taking up more than 10 percent of the market, is not a threat to them. Microsoft is using threats of patents of questionable existence or legality, in conjunction with threats of taking much smaller companies with far fewer legal resources, to court. I understand from the news that Microsoft has been filing antitrust complaints against Google. Microsoft, meanwhile, is using its enomous size and power to cut down any competitors, including Google, that get in its way. I don’t believe I have to remind you about Steven Ballmer’s threat that he would “f—-ing kill Google.” Given that Microsoft killed Netscape (an earlier competitor), who could question that Ballmer means it? In another article (http://www.linuxplanet.com/linuxplanet/reports/6998/1/), Linux Planet reports that Microsoft has forced agreements on Amazon and I/O Data. Because of Microsoft’s enormous size and market position, it is slowly killing Linux, with no one left to fight or show that its patent claims are farcical. I do not question the rights of companies to hold legitimate patents concerning legitimate work done within the company. I do question an enormous company’s right to cry “patent infringement” while bullying smaller companies into accepting whatever it says while no one can fight back. Please look into this situation and keep Microsoft from using it’s monopoly status to destroy competition. Ubuntu 10.04 (Lucid Lynx) LTS Beta 2 was released Thursday, April 8 as scheduled. I will try to list new features that I have not already covered. A full announcement was made on http://fridge.ubuntu.com/. New desktop features include what is known as “Social from the start” – Lucid features built-in integration with Twitter, identi.ca, Facebook and other social networks with the MeMenu in the top panel. Ubuntu Netbook Edition is now optimized to run on Intel atom-based netbooks. The netbook edition also includes a new interface that allows users to quickly and easily get on-line and use their preferred applications. The desktop version will now be using GNOME 2.30, and OpenOffice.org 3.2.0. The full release notes can be found at http://www.ubuntu.com/testing/lucid/beta2. As always, upgrading from Ubuntu 9.10 or (since this is an LTS release) Ubuntu 8.04 LTS simply requires pressing Alt + F2 and typing in “update-manager -d” (without the quotes) into the command box. Once Update Manager tells you, New distribution release “10.04” is available, you then need to click Upgrade and follow the on-screen instructions. One last note: Rick Spencer of Canonical has announced that for the final release of Lucid, Ubuntu will use Google as the default provider. Lucid Lynx (Ubuntu 10.04) is nearing release. The Beta 2 release is scheduled for April 8 (2010). The release candidate is scheduled for April 22. The final release is scheduled for April 29. The reason I am harping on this is that Mark Shuttleworth has announced that Ubuntu 10.10 planning is already in the works, and it will be called Maverick Meerkat. Silly me, I thought normal people were still on Karmic! Fortunately, besides blowing the mind of my spell checker, Maverick Meerkat will have a serious amount of new developments. The new theme is “Light,” which will be adopted at many levels. 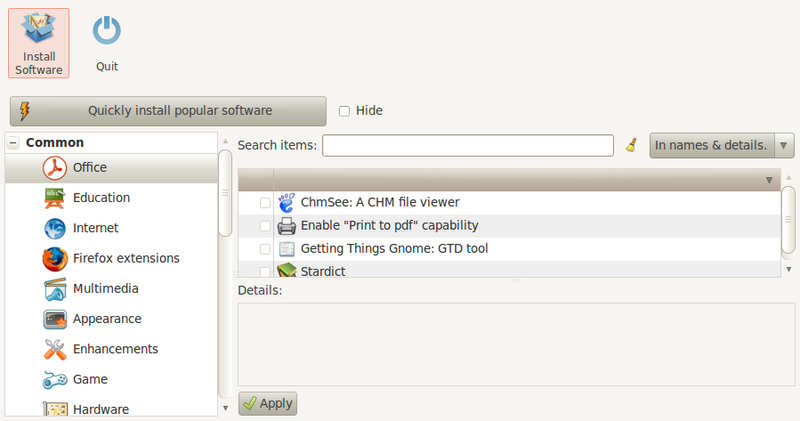 The Ubuntu Netbook Edition user interface, for instance, will be revamped. The Ubuntu developers will be working toward “the fastest boot, the fastest network connection, the fastest browser” for Ubuntu Netbook Edition. October 28, 2010 – Final release.